Tooth decay damages and breaks down teeth. When your child eats and drinks, bacteria in their mouth feed on the sugars that are found in these foods and drinks. The bacteria create acids that can break down the hard, outer layer of their teeth, called enamel. Each time your child eats or drinks, that acid can attack their teeth for 20 minutes or longer. Over time, tooth decay can develop and a hole in their tooth (a cavity) can form. Bacteria in the mouth change the sugar in foods and drinks into acid that attacks the teeth. Each time you eat or drink, that acid can attack the teeth for 20 minutes or longer. Over time tooth decay can develop and a cavity can form. How does tooth decay affect baby teeth? Tooth decay can start as soon as your baby's teeth come in, usually by age 6 months. This can cause pain and the infection can spread. 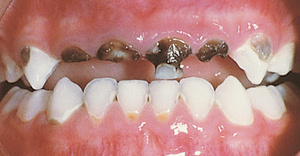 If decay is not treated, it can destroy the baby teeth. Parents are often surprised to learn that tooth decay can begin as soon as a baby's teeth come in, usually by age six months. 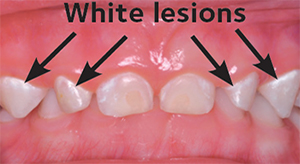 Decay in baby teeth can cause pain, and the infection can spread. If decay is not treated, it can destroy the baby teeth. Tooth decay can also have an effect on your child's general health. If they have tooth pain, they may have trouble eating. This can get in the way of them growing up healthy. Baby teeth hold space in the jaw for the adult teeth. If a baby tooth is lost too early, the teeth beside it may drift or move into the empty space. When it's time for the adult teeth to come in, there may not be enough room for them. This may cause adult teeth to be crowded and crooked. Crooked and crowded teeth may be harder to keep clean. 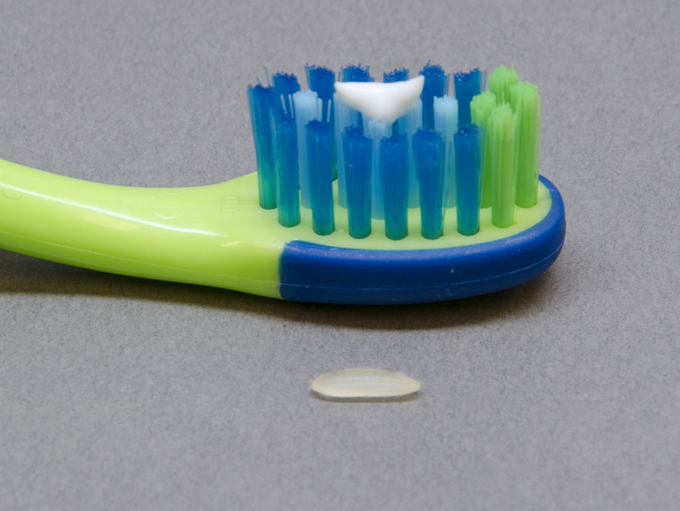 If a baby tooth is lost too early, the teeth beside it may drift into the empty space. If a child's baby teeth are healthy, it is more likely his adult teeth will be healthy too. Children who have decay in their baby teeth are more likely to have decay in their adult teeth. 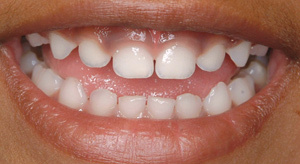 Decayed and crooked teeth also can affect your child's self-esteem. Tooth decay is not only unhealthy, but it also looks bad. If your child has tooth decay they may feel bad about their smile. But a nice-looking smile can give your child confidence at school. Children learn healthy habits from their parents and caregivers. You can start good habits if you clean your child's teeth every day, feed your child a healthy diet and take them to the dentist on a regular basis. • Wipe the baby's gums with a clean, wet gauze pad or washcloth after each feeding, before sleep. This removes bits of food that can harm teeth that are starting to come in. It also helps the child get used to having their mouth cleaned. •Start brushing your baby's teeth 2 times every day (morning and night). • Use a child-sized toothbrush with soft bristles and a grain-of-rice sized amount of toothpaste that has fluoride (FLOOR-eyed). Fluoride is a mineral that helps keep the outer layer of teeth strong. This can help lower the risk of tooth decay. • Your child should not be allowed to fall asleep while breastfeeding. • Infants should not be put to bed or allowed to fall asleep with a bottle that contains milk, formula, fruit juices, or any liquids with sugar. Even watered-down drinks can damage teeth. • If your child uses a pacifier, don't dip it in sugar or honey, or put it in your mouth before giving it to your child. Bacteria in your mouth that causes decay can be passed to your baby. • A bottle should not be used as a pacifier. Sipping sugary liquids during the day can cause tooth decay, too. When your child's second, third and more teeth come in (around 8 months old). • Try to get your child to drink from a cup by their first birthday. Training cups should be used for only a short time. • Once your child has learned how to sip, the training cup is no longer needed and should be set aside. • Don't let your baby constantly sip on liquids with sugar (including juice). If they are thirsty between snacks or meals, offer water. • Brush your child's teeth for them 2 times a day and for 2 minutes each time. Clean between their teeth as soon as they have 2 teeth that touch. • The American Dental Association recommends that you brush your child's teeth until they are at least 6 years old. When your child is old enough to do the brushing, watch to make sure they're not "rushing the brushing." 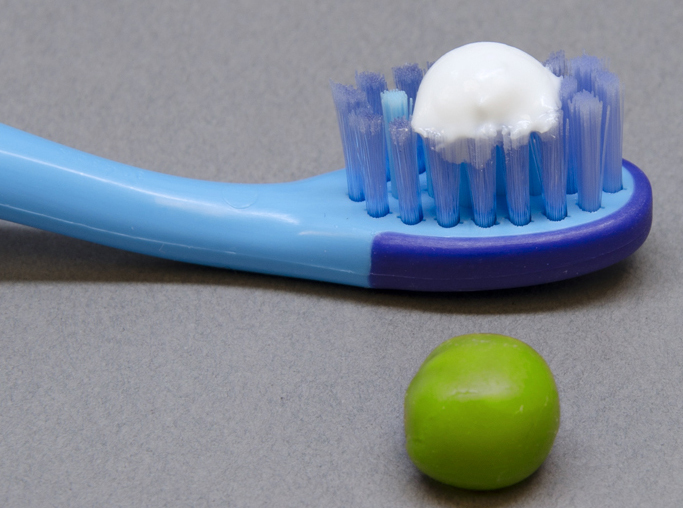 Teach your child to spit out the toothpaste and not to swallow it. • Limit giving snacks in between meals. • A new guideline from the American Academy of Pediatrics recommends that you do not give your child any kind of juice until after their first birthday - even 100% juices. • Try not to use sweet foods and drinks to reward your child. • If your child eats sweets, make sure it is with a meal. • Infants and young children should have a healthy diet. Information can be found at www.choosemyplate.gov. • It's helpful to have the first visit after your baby's first tooth appears, but no later than their first birthday. This first visit is a "well-baby checkup" for your child's teeth. • At this visit, your dentist can check for decay and other problems. They can show you how to properly clean your child's teeth. • Also, your dentist may offer advice on your child's diet, pacifier use, and oral care products for your family. • Your child should get the right level of fluoride to help prevent tooth decay. Ask your child's dentist about how your child can get the right amount of fluoride. Initial decay photo courtesy of David M. Hassan, DMD.